‘Unhinged’ is how Dominic Grieve described his Brexit-supporting colleagues on the Conservative benches in the House of Commons. Or was it just some of his colleagues? Perhaps it was just those who favour a ‘hard’ Brexit (ie leaving the Single Market and the Customs Union), which includes Theresa May (doesn’t it?). But Dominic Grieve said: “I do sometimes think that some of my colleagues have become unhinged, actually. Not the Prime Minister at all.” So he couldn’t have been including the Prime Minister in his assessment of mental derangement, for he said he didn’t, and Dominic Grieve is a lawyer and honourable man. He added ‘paranoid’ and talked of ‘hysteria’, but it isn’t clear whether those terms were aimed at all Tory Brexiteers or just some of them, or whether he included the Prime Minister in his assessment of irrational feeling and ungovernable emotional excess. Presumably not, since to accuse a woman of ‘hysteria’ is patently sexist and derogatory, and Dominic Grieve would never indulge in such boorish prejudice, for he is an eloquent, sophisticated lawyer, and an honourable man. (5A) Within seven days of a statement under subsection (4) being laid, a Minister of the Crown must move a motion in the House of Commons to seek approval of the Government’s approach. (5B) In the event of no political agreement having been reached on a withdrawal agreement by the end of 30 November 2018, a Minister of the Crown must move a motion in the House of Commons setting out how the Government intends to proceed and seeking the approval of the House for that course of action. (b) the subject of a motion which has either been debated in the House of Lords, or upon which the House of Lords has not concluded a debate on the motion before the end of the period of five sitting days beginning with the first sitting day after the day on which the House of Commons passes the resolution mentioned in paragraph (a). All very honourable and lawyerly, but it basically meant that Brexit Secretary David Davis wouldn’t be able to say to Michel Barnier, “Okay, I’ve had enough of this, we’re leaving, goodbye.” A ‘no-deal’ scenario would be off the table. Since Monsieur Barnier isn’t a stupid man, he’d know that all he had to do to ensure (or increase the chances of) the UK remaining in the Single Market and the Customs Union (ie ‘soft Brexit’ [ie no Brexit at all]) would be to haggle and wrangle with David Davis until 30 November 2018, and then there would be a statutory obligation upon the Government to ask Parliament to approve its strategy. If Monsieur Barnier managed to haggle and wrangle and puff and bluster for 10 further weeks, up to 15th February 2019, Parliament would then ‘take back control’ and instruct the Government in how the final Brexit should be shaped. That is to say, Parliament would bind the hands of the Executive and debate all UK-EU negotiations openly, so Monsieur Barnier would only have to watch the telly to know what proposals were coming his way. Despite being clever and lawyerly (though by no means wishing to frustrate Brexit, Dominic Grieve insisted), this amendment was rejected by the House of Commons last week by 321-305. There is some dispute about what the Prime Minister promised to get this through, with talk of Mr Grieve having been double-crossed. You can insult Dominic Grieve and call him a traitor and a rebel or accuse him of consorting with the enemy, or you can understand that he is simply a life-long Remainer and an honourable lawyer who is finding it difficult to come to terms with the seismic result of the 2016 EU Referendum, when a majority decided it was time to leave the European Union. He loves the EU for its sophisticated enlightenment; he despises Brexiteers for their lack of sophistication and enlightenment. In his lawyerly way he is not seeking to frustrate Brexit, but to rescue Brexiteers from their foolish selves. In this noble pursuit he is no traitor to Queen or Country because he sincerely believes that it would be best for Her Majesty and even better for the United Kingdom to remain in (and become increasingly absorbed by) the European Union. As we leave the European Union, we will no longer be members of the single market or customs union. We will seek a deep and special partnership including a comprehensive free trade and customs agreement. We will pursue free trade with European markets, and secure new trade agreements with other countries. The negotiations will undoubtedly be tough, and there will be give and take on both sides, but we continue to believe that no deal is better than a bad deal for the UK. Dominic Grieve evidently does not believe no deal to be better than a bad deal (and manifestly never has), so he seeks to bind David Davis (or his successor) from being able to walk away if the EU persists with unreasonable demands or unacceptable impositions. No doubt he would express it in more clever and lawyerly verbiage, but that’s the thrust of it. Mr Grieve feels so passionately about this that he is prepared to go so far as toppling Theresa May and collapsing the Government. Corbyn has been consistent on Europe throughout his career. He voted against EEC membership in the 1975 referendum. In 1993, he voted against the Maastricht Treaty, which paved the way for ever-closer European integration. Ten years later, in sharp contrast to Labour leader Tony Blair, he was hostile to the Euro. He rightly warned it would lead to ‘the imposition of a bankers’ Europe’, as the Irish, the Greeks and the Italians have found to their terrible cost. Of course, Corbyn’s reasons for supporting Brexit are different indeed to those that drive Tories like Jacob Rees-Mogg and Boris Johnson, who seek to liberate us from the shackles of an unelected bureaucracy in Brussels. Corbyn opposes the European Union because he believes it is a capitalist club which will prevent him nationalising Britain’s key companies and industries, and turning the country into a socialist state. 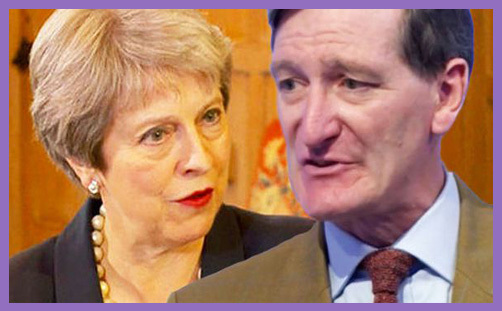 So, if the highly distinguished Rt Hon Dominic Grieve QC MP helps to collapse the Government and this leads to Prime Minister Jeremy Corbyn (as prophesied…), the UK would most definitely leave the Single Market and the Customs Union (ie Brexit would mean Brexit), and the name of Dominic Grieve would be archived at the Bodleian in infamy, shame and ignominy for all eternity. What a very sad end to an honourable political and legal career that would be.